I’m looking for a 1981 reddish brown monkey. It’s all furry material, has reddish-brown face and bottoms of hands and feet, with cream-colored tops of hands and feet. The face mask area has white-ish chin, black eyes, pink nose, and the brow area of face is arched over each eye. It also has Velcro pads on the hands. My daughter, who will be 33 in October, has three children she’d like to share this with. She recently found this picture from college. Unfortunately, her pscho roommate dumped a bunch of her stuff back then, and he was in the box. She swears there was a copyright tag on it that had 1981 on it, but can’t remember anything else. It would make sense, as that’s the year she was born. But we can’t remember who gave it to her or when. 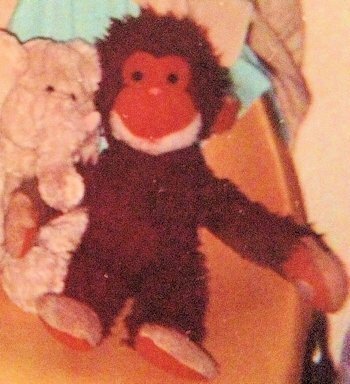 He was always her favorite buddy, even in college, and she has looked for him before, but never had his photo until now. Please help me make my baby’s birthday the best!